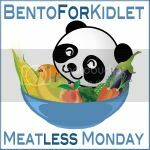 Bento for Kidlet: ThrifTee Gear Review and Giveaway! 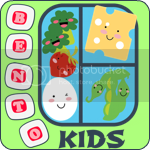 I have been blogging about bento lunches now for over 5 years! Amazing! As Kidlet gets older I always brace myself for the day that he doesn't want me to pack his lunches anymore but I have been thrilled that it hasn't happened yet!! 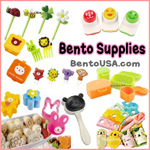 A lot of my bento buddies find that upper Elementary and Middle School is the time when interest in cutesy goes away. While I have a lot more rules from Kidlet about what's school okay and what isn't he still lets me use a lot of cute stuff. Next year we step in to the category of teen and that makes it even more challenging! Making acceptable school lunches for teens can be challenging! I was really thrilled to recently find out about ThrifTee Gear which is an amazing company that makes amazingly cool lunch bags out of t-shirts!! What a genius idea! Kidlet and his friends LOVE cute nerdy shirts and I love to buy them but they grow so fast it's sad when they no longer fit. Why not make a beloved shirt in to a lunch bag. 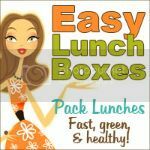 Style and waste-free lunches in one little package!?! Fantastic! These are great lunch bags for older kids or for those little ones who are advanced in their epicness! You can choose from already made bags at $14.95 which includes shipping to anywhere in the US or send in your own tee to be made in to a bag for $19.95 which includes two-way shipping! 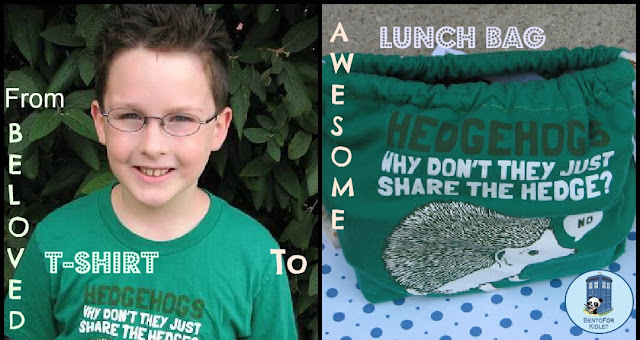 Kidlet recently outgrew a lot of his favorite shirts so it was a tough decision for the lunch bag but he ultimately decided to go with his beloved Hedgehog tee! I am really glad he chose this one because it is so adorable! He loves his new lunch bag! It's really sturdy and has a great lining that makes wiping out spills a snap! And now for the best part, for you anyway ;) ThrifTee Gear is giving one of you lovely readers a custom bag of your own! You'll get to raid your closet for your best lunch bag material and then you too can be one of the cool kids! Disclaimer: ThrifTee Gear made my kid's shirt in to an amazing lunch bag in order to facilitate my review. All opinions expressed are my own and no other compensation was provided. Woop. I love the Wally World bag!!!!! I love the Curious George bag! I would have to go with the Tootsie Pop bag even though my son would have no idea what it meant. Although, I might have to draw some pants on that cartoon. I like the I love NY bag. Oh I like Wally World! I want the I'm a Pepper bag! I love the "Wanna Lick" bag! So cool! I like the Curious George one. I like the tie-dyed bags! I want your sons bag, too...he'd hogs rule!! I love the Mickey Mouse! um, the bonnaroo shirt for sure!